Happy Friday, everyone! It is unseasonably warm in Montana right now, which I am absolutely okay with!! Although, still VERY smoky from all the fires surrounding us...which makes it so you can't really be outside in this beautiful weather. So- it is pretty much a catch 22...what can you do? All I know is I am in favor of higher temperatures, because winter is going to be here before I know it (which honestly makes me a little miserable even thinking about it. So- I should just move along). 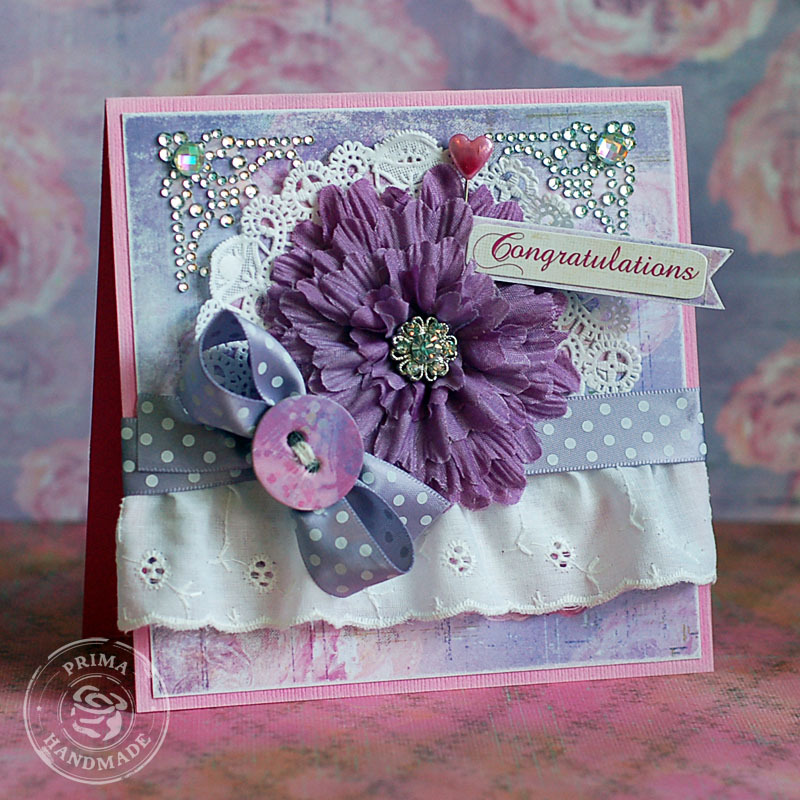 I have another card to share with you today using some stamps from the last WPlus9 release. 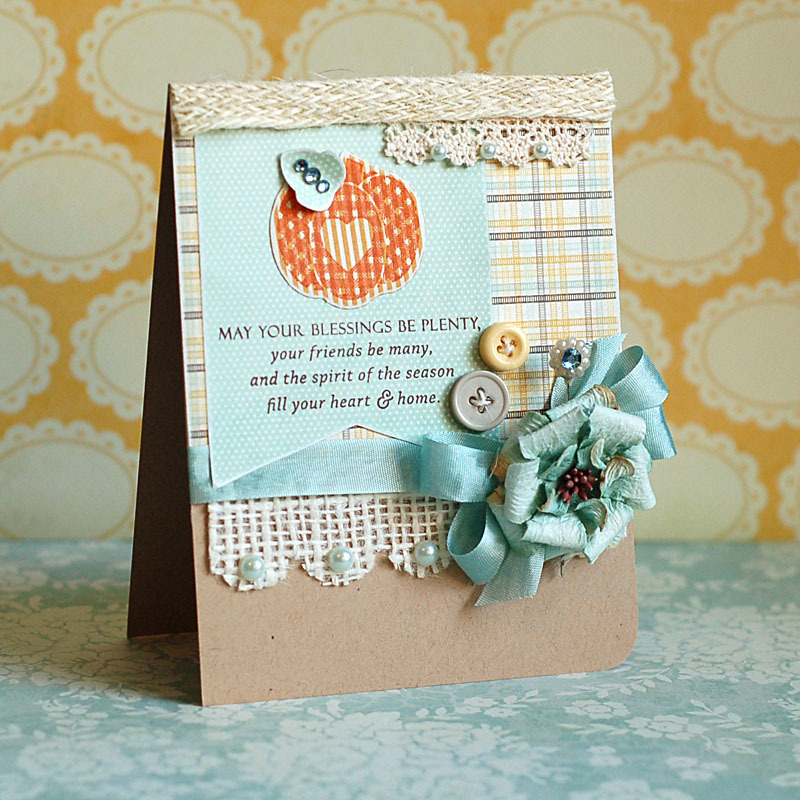 I just love this sentiment, and the cute little pumpkin that goes along with it....which I've paired with some older MME papers and pretty embellishments. Check it out! 1. 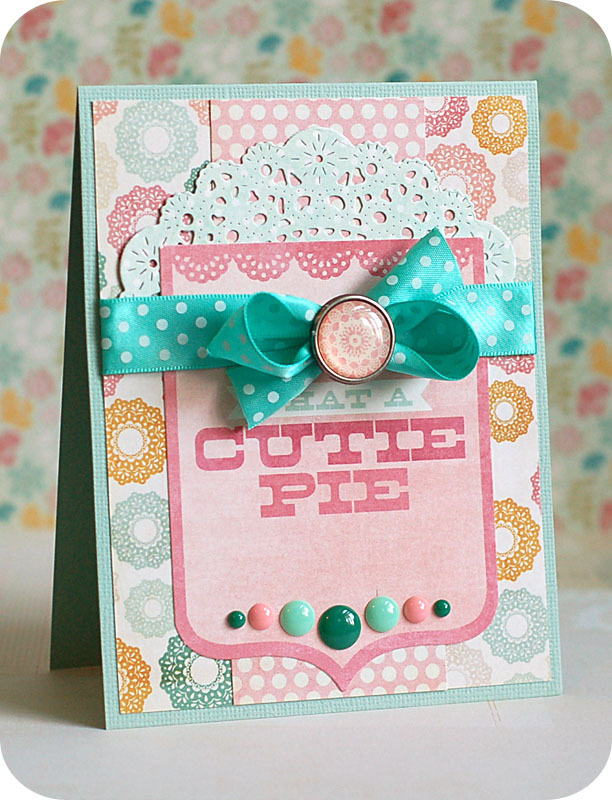 Make A2 card from kraft cardstock, then round the bottom right corners. 2. Sand the edges of a plaid paper block, then adhere to the top. 3. Diecut a scalloped edge to a piece of burlap, and adhere below the plaid paper. Accent with pearls. 4. Tie a double bow around the seam, and accent the middle with a paper flower. 5. Cut a banner from blue paper, sand the edges, stamp the sentiment & adhere to the left side. 6. Diecut the pumpkin & leave from patterned papers, then stamp the pumpkin image. Layer together, and accent with blue rhinestones. Adhere right above the sentiment. 7. Layer a small strip of crochet lace & a strip of woven burlap to the top, and then accent with pearls. 8. Add two twine threaded buttons above the bow, then add a stick pin to the bow and top with a jewel. I love verse 13, "When tempted, no one should say, "God is tempting me." For God cannot be tempted by evil, nor does He tempt anyone." I pretty much hate the "blame game". God put this temptation in front of me because He is testing me. He wants to know what I will do and how I will face it. Ummmm....no. God doesn't entice us to sin. We do that completely on our own. God is perfect and holy and without sin. He is not going to dangle temptation in front of us like a carrot. But He is going to allow us to freely deal with the temptations we create for ourselves. It's called FREE WILL people, and we have it!! I see dealing with temptation as part of our perseverance...we'll stumble & fall & fail a hundred times over... but at some point we will hopefully conquer. I found this anonymous quote, "Unless you have never been tempted, don't pass judgement on someone who has yielded." Persevering through temptation can only make us more compassionate to those going through the same thing. And don't try to fool yourself into believing you aren't tempted by anything....just sayin'. Ahhhh....listening. The one thing that I actually already do well!! Thank you, James!! I don't feel like such an underachiever now!! Tee hee! Happy Thursday, friends!! I hope your week has been a good one so far! Are you looking forward to the weekend? I know that I am! Going to head over to Spokane for a couple days, and hang out with my Aunt Amy and cousins Rylee & Molly. We have to take Ry's senior portraits over the weekend...so I am going to actually take my D700 out of my purse and actually press the shutter. Amazing....I know. It's been awhile. So, I have a card to share with you today! I was unable to participate in the last release for WPlus9, so I have been working on some projects featuring the product that I haven't had the chance to use yet. Also, using some of the latest from Glitz Design...which will be hitting your favorite stores in the next week or so!! They just got the HUGE shipment of all the embellishments yesterday.... Here is what I created! 2. Cut polka dot paper slightly smaller, distress the edges and adhere. 3. Sand the edges of a printed circle diecut and adhere. 4. Cut a strip of floral paper, distress the edges and adhere. 5. Wrap grey seam binding around the top and tie a double bow. 6. 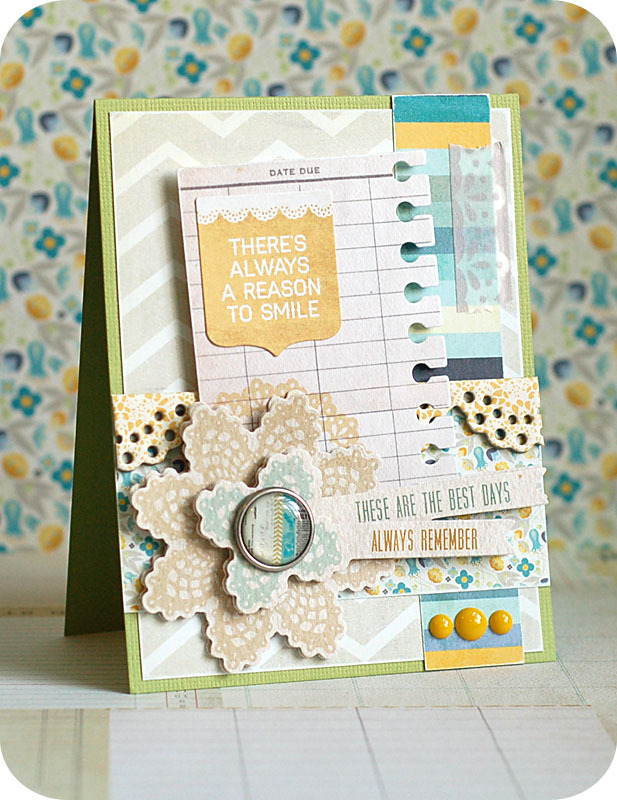 Sand the edges of a cardstock sticker & a patterned paper block, then adhere together. 7. 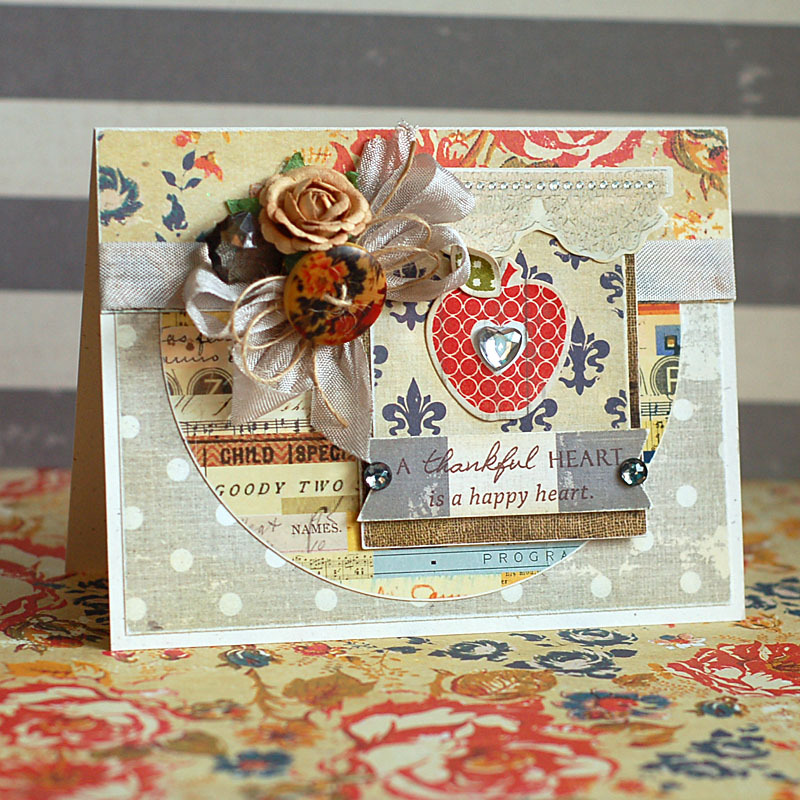 Stamp the apple to woodgrain paper, distress ink & accent with a jewel. Adhere to the cardstock sticker. 8. Cut a banner from striped paper, distress the edges and stamp the sentiment to it. Adhere below the apple, then accent with jewels. 9. 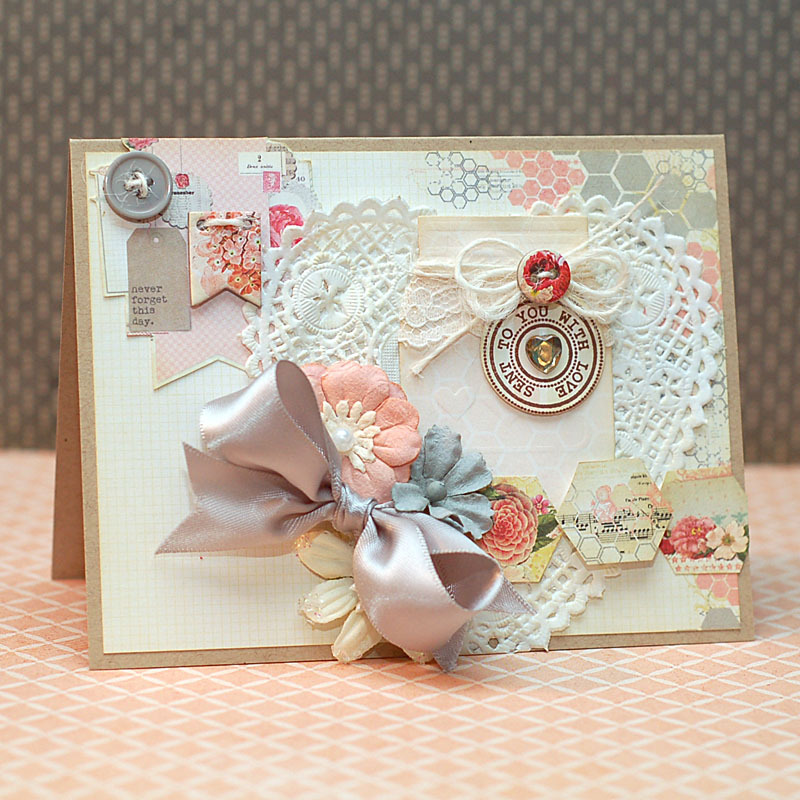 Adhere the entire sentiment block to the right of the double bow, then accent the top with a scalloped diecut & sticker. 10. Top the seam binding bow with a double twine bow, button, flower & jeweled charm. And now, I would like to introduce something new to my blog. I recently read a book called "A Modern Girl's Guide to Bible Study" by Jen Hatmaker. I not only read it, but did all the exercises and such listed in the back of the book....and it changed how I think about studying the Bible. The author literally spoke my language, and addressed why I have had such a hard time really wanting to study the Bible and applying it to my life. Let me preface this by saying I don't have it all together. Far from it, actually. I am a girl who believes in Jesus and what He did for me on the cross. I am a girl who wants to strive to be more like Him everyday, but fail miserably at it for the most part. I love the Bible and all the promises, hope, comfort & peace it has for us...but it also leaves me confused and frustrated at times. I am not a quote unquote "Bible Thumper". While my Bible is open on my lap, People.com and Facebook are open on my laptop. I'm known to have a drink or two, and I don't think bars are where only "sinners" go. I struggle with selfishness, vanity, perfectionism, unforgiveness...the list is long. I will never have a holier than thou attitude because of those struggles. I will never protest, hate, or judge who you are (except for maybe your outfit....tee hee! ), because I truly believe in "promoting what you love instead of bashing what you hate". With all that being said...I am going to do two days at a time for the next two posts, as I just decided I wanted to add it to my blog...thus the blog is a little bit behind. 1. Steady persistence in a course of action, a purpose, a state, etc., especially in spite of difficulties, obstacles or discouragement. 2. Theology - continuance in a state of grace to the end, leading to eternal salvation. Consider it pure joy to face many trials and persevere....well, James - you just get right to it, huh? I can admit to rolling my eyes while reading these 4 verses.... (I apologize, James. Can you forgive me?) Not because I don't agree with it, but because it is so easy to read, yet not so easy to live up to. I know when I'm struggling, I just want to check out. Crawl into my bed, roll up in the covers and just wait for it to be over. It's the part of me that avoids conflict at all cost. "When prayer is less sweet and easy; when love is less animated and tender; when the presence of God is less evident and less consoling; when even outward duties are fulfilled with less facility and enjoyment; then faithfulness is greater when maintained under those painful circumstances, and that is all that God requires." I guess I see perseverance and faithfulness as a happy couple - they go hand in hand. Verse 12 from The Message translation says, "Anyone who meets a testing challenge head-on and manages to stick it out is mighty fortunate. For such persons loyally in love with God, the reward is life, and more life." My prayers from this is to be a stronger person. To tackle my demons head on, and be a better person in spite of them. Maybe even because of them. To be faithful to God as I tackle them, and to persevere when I just want to go stick my head in the sand. Lord- help me to be a stonger woman. Help me to be the woman that you see me as. And on that note...have an awesome day! Happy Tuesday, everyone!! I hope you had a wonderful weekend!! It was a rough football weekend for us...the Griz lost there homecoming game (ugh), Auburn lost by 2 points to LSU, and Arizona didn't even score against Oregon. Blech...let's hope this weekend gets better!! I created a couple more cards for the last Prima Firefly Friday feature, which went up on the blog last week. So, today I wanted to share those cards with you!! The Firefly collection has some really amazing colors, and I think you will be surprised that both of these cards I created came from the very same collection. Check them out! 1. 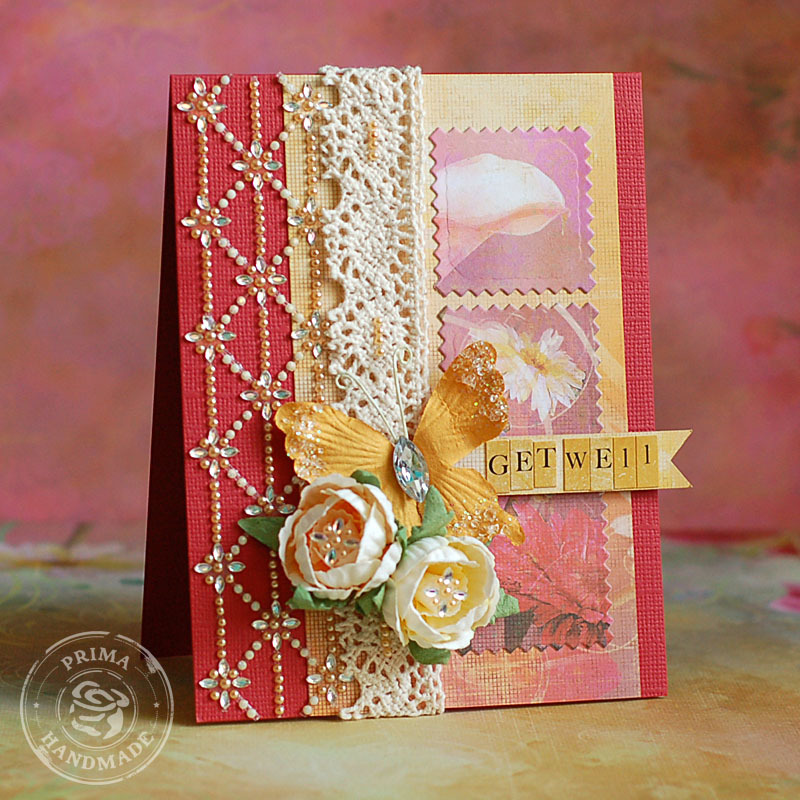 Make A2 card from red cardstock. 2. Cut a strip of orange paper, and adhere to the right side. 3. Diecut three pinked squares from floral paper, then adhere to the right side. 4. Adhere the bling border to the left side, then adhere crocheted trim right next to it. 5. Cut a banner from yellow paper, then add the sentiment to it with alpha stickers. 6. Adhere the banner to the front using foam adhesive, then cluster a paper butterfly and flowers to the left side of it. 7. Accent the crochet trim and flowers with leftover jewels from the border. 1. 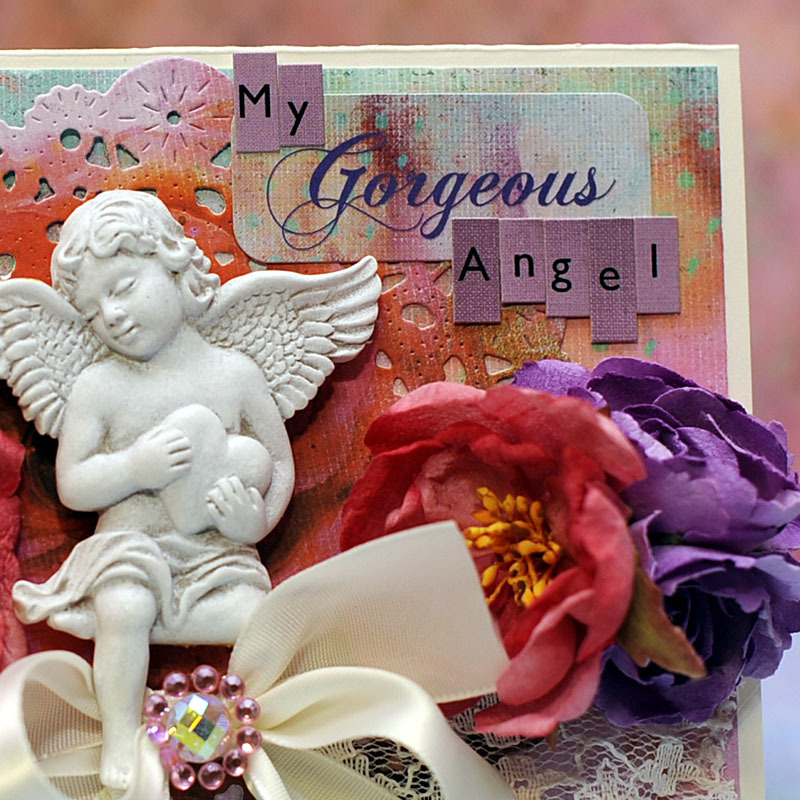 Make 5-inch square card from pink cardstock, then ink the edges white. 2. Cut purple paper slightly smaller, sand the edges and adhere. 3. Adhere a white doily to the middle, then wrap white lace around the bottom of it. 4. Tie ribbon around the top of the lace, then add a button to the bow center using twine. 5. Adhere the flower to the middle, then accent the top sides with jewel corners. 6. Cut a banner strip from purple paper, then sand the edges. Add the sentiment sticker to the middle. 7. Adhere the sentiment banner around a pin heart pin, then stick into the flower to finish. I still kind-of can't believe that these two cards came from the very same paper line...that is how cool the Firefly collection is!! Lots of different options available with it!! Thanks for checking out my creations today, and I will be back soon with some more things to share! 2. Cut honeycomb paper slightly smaller, distress ink the edges and adhere. 3. 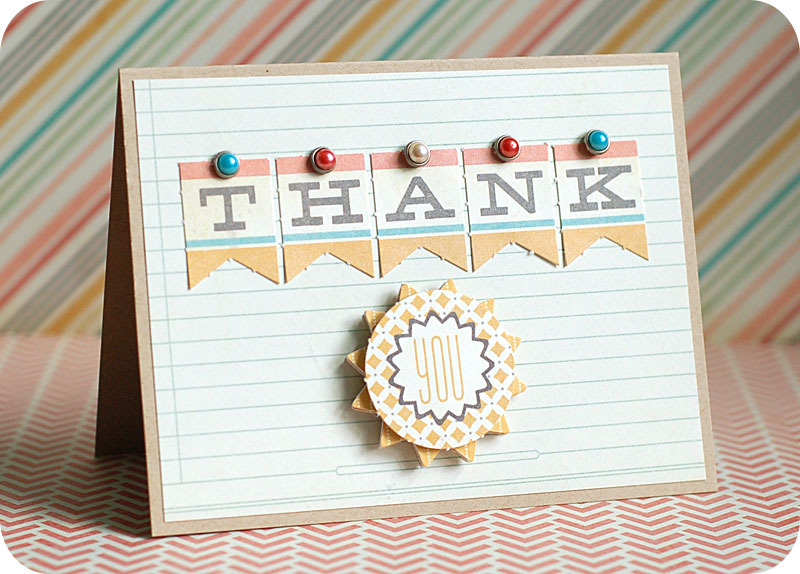 Cut graphic from patterned paper, distress ink and adhere to the upper left corner. 4. Distress ink a heart doily, then adhere to the right side. 5. Diecut the jar & tag from patterned papers, then distress ink the edges. 6. 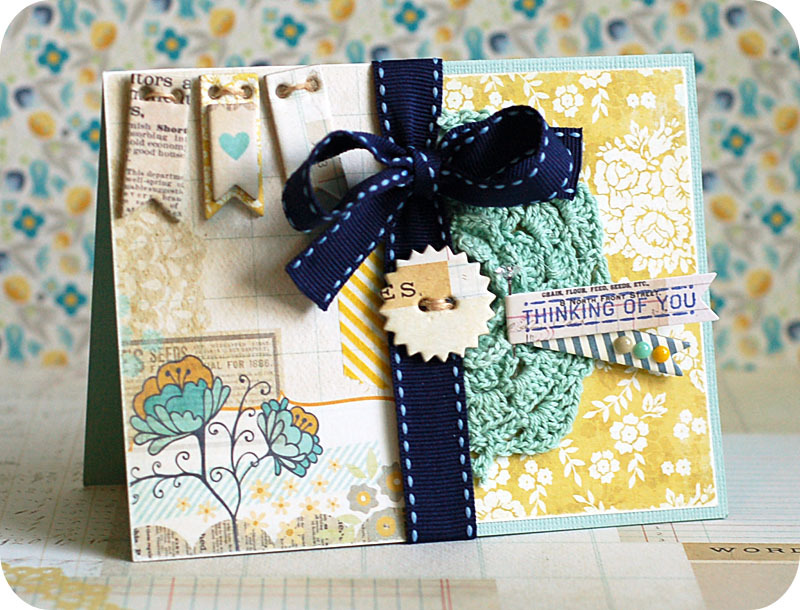 Stamp the sentiment to the tag, then layer to the jar with lace and twine. 7. Add a button to the twine bow, and a heart jewel to the sentiment tag. Adhere the entire jar to the doily. 8. Accent around the jar with flowers, a grey bow and hexagon shapes. 9. 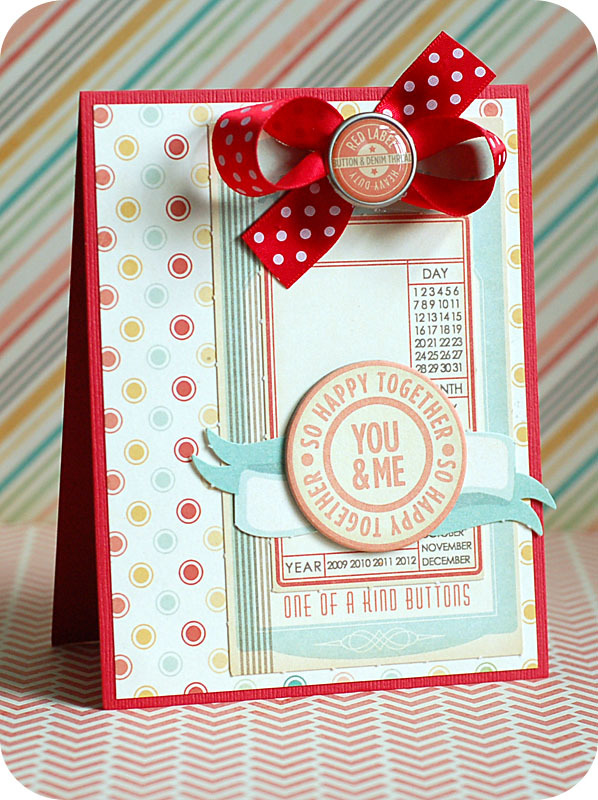 Accent the graphic with a chipboard banner & a button. Hey there, everyone! Long time no blog...I know, I know. I have just been crazy busy this past month and a half with weddings, family things and such. It is typically around this time that my blog takes a bit of a break each year...and it was no different this time around!! However, I was emailed awhile back by Stephanie Howell...asking me to be a guest designer for My Mind's Eye for the month of August. And I absolutely couldn't resist doing that!! MME is one of my very fave companies out there, and I had a great time putting together some cards for them. Here is what I created!! For supply lists and such, please see the blog posts on the My Mind's Eye blog that are linked below! I hope that you liked my cute little collection of My Mind's Eye cards! Sorry for taking such a large break from my blog....here is hoping that I will have a bit more time now to get some new projects created and share them with you!